Born in Baltimore, Maryland, the daughter of William and Mary Newport, Anne Newport Royall was a writer and editor, frequently credited as the "first American newspaperwoman." As her early biographer writes in The Life and Times of Anne Royall (1908), the Newport family, like many of their contemporaries, moved "west," first to Virginia and then into "the frontier Pennsylvania" in 1772: "the men and women who moved into this so-called 'western' wilderness sought neither gold, nor adventure, nor the establishment of any one form of religious faith. Their sole object was to secure that blessing most highly prized in all ages by the Anglo-Saxon heart—a private home." Our cabin, or camp, rather, was very small—not more than eight or ten feet. This contained one bed, four wooden stools with legs stuck in them through augur holes, half a dozen tin cups and the like number of pewter plates, knives, forks and spoons, though my sister (very mischievous) broke one of the spoons and seriously damaged one of the plates, for which I was chastised. Besides these we had a tray and a frying-pan, a camp kettle and a pot; and our cabin was considered the best furnished on the frontier. Like many of their neighbors, the Newport family found themselves under threat by displaced Native Americans. The family was forced to take refuge in a "fort," not so much a military stockade as a small settlement where several families lived--"if it could be called living," Anne would tartly write about life in such "pioneer forts." After the early death of William Newport, Mary Newport remarried, her second husband a man named Butler, but he died in 1782 in an Indian raid. By 1785, in a terribly impoverished state, the widowed Mary Newport Butler moved her small family to Staunton, a small town in western Virginia, where she had relatives. She eventually took up a position as housekeeper for William Royall, a wealthy farmer in Sweet Springs, Virginia, who had been a major during the American Revolution. William Royall seems to have recognized potential in the sixteen-year-old Anne--he undertook to have her educated, opened his library to her, and, in 1797, married the now twenty-eight-year-old woman. The couple lived together happily until William Royall's death in 1812; he left her the use of his estate in his will, but his family contested it, claiming the two were never legally married. Years of litigation followed, and although the will was upheld in 1817, that ruling was appealed, and in 1819 a jury annulled it. 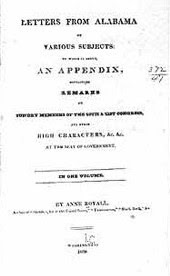 Dispossessed of her husband's provision for her, Anne Newport Royall spent the next years traveling (primarily in Alabama) and writing, a collection of her observations about the state, later published by subscription as Letters from Alabama (1817-22). In 1824, she traveled to Washington, D.C., hoping to be granted a pension as a widow of a Revolutionary War soldier. (Her husband's family would, in 1848, claim her pension money.) There she met President John Quincy Adams, conducting what is sometimes claimed to be the first presidential interview by a woman. Adams also bought a subscription to support her publication of a new work, one that would recount her travel through New England. Leaving Washington, she traveled in New England. Her Sketches of History, Life, and Manners in the United States was published in Hartford, Connecticut, under the pseudonym "A Traveller" in 1826. Her forthright critiques--she did not shy away from describing honestly what she saw and experienced--caused problems for her, with one critic deriding her as a "literary wildcat from the backwoods." Back in Washington, she suffered further indignities after she raised objections to a group of Presbyterians being allowed to meet in a publicly funded firehouse. A member of the congregation claimed Royall had cursed her and, once again, she found herself in court, where she was convicted of being a public nuisance, a "public brawler," and a "common scold"; she was fined ten dollars, her fine being paid by two local newspapermen. Royall turned once again to traveling, publishing a novel, The Tennessean, in 1827, and then further selections of her travel writing: The Black Book, or, A Continuation of Travels in the United States, in 1828, and Mrs. Royall’s Pennsylvania, or, Travels Continued in the United States, in 1829. Her Letters from Alabama was finally published in 1830), and Mrs. Royall’s Southern Tour, or, Second Series of Black Books appeared in 1831. Back in Washington in 1831, she also began publishing a weekly newspaper, Paul Pry, the first issue appearing on 3 December of that year. The newspaper included her own editorials, "excerpts from other papers, advertisements, letters to the editor–-and her lengthy replies." She was intent on exposing government corruption--and when postmasters refused to deliver her papers, she published their names, along with the names of subscribers who were late with their payments. The title of her newspaper was later changed; under its new name, The Huntress, publication continued until 2 July 1854, just two months before her death, at age eighty-five, on 1 October. During those years, Royall continued to pursue cases of governmental corruption, fraud, incompetence, nepotism, and graft. She exposed corrupt practices that defrauded Native Americans, and while she opposed slavery, she also opposed the tactics of abolitionists. For good measure, although she disliked both alcohol and drunkenness, she also opposed temperance activists. Her personal knowledge of the public men of her time is most remarkable. She met and talked with every person who filled the presidential chair, beginning with Washington and ending with Lincoln. It was probably on the occasion of his visit to Sweet Springs in 1797 that she saw General Washington. She chatted with John Adams in his own home when he was eighty-nine years of age. Lincoln she must have seen during his one term in Congress. She even met Lafayette on his visit to Boston in 1825. The great Frenchman gave her a letter in support of her pension claim. While I am always bitching about the Encyclopedia Britannica for its failure to include women, there is a brief article there on Anne Royall. So, yay? For an excellent essay by Cynthia Earman, "Uncommon Scold," click here. Sarah Harvey Porter's 1908 biography of Anne Royall is available in full by clicking here. Elizabeth J. Clapp's recent A Notorious Woman: Anne Royall in Jacksonian America is also available. One year from today, on 1 June 2018, the Rubens House museum (Antwerp) will open the first survey exhibition of a "lost" Baroque painter, Michaelina Wautier. Of course Wautier hasn't been entirely lost, though recognition of the painter has been very long in coming. In her comprehensive survey of "the fortunes of women painters and their work," first published in 1979, Germaine Greer includes Wautier even while noting that only four works by Wautier were known to exist, one surviving only in an engraving (The Obstacle Race). The situation today is somewhat improved. Almost nothing is known about Michaela Wautier's life, aside from her dates of birth and death. She was probably born in Mons, capital city of Hainault, in 1617, lived and worked in Brussels, had an elder brother who was also a painter, and died in Brussels in 1689. 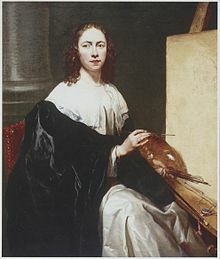 Unique for seventeenth-century women painters, Wautier painted in all contemporary genres, including portrait, history, still life, and genre painting. But after her lifetime, Michaelina Wautier's name, if not her work, disappeared. As Julia Baumgartner notes, Wautier's surviving work was mostly misattributed, to her brother Christopher, for example, or to Artemisia Gentileschi. Aside from the seventeenth-century inventory of Duke Leopold's collection, information about her work is still scarce. A cycle of five paintings representing the five senses is known from two nineteenth-century sales: "The five individual works on canvas date from 1650 and all (or most) of them are believed to be signed and dated. They share the same dimensions (68 x 58 cm or 70 x 61 cm) and were twice auctioned as a series in Valenciennes (France) in the nineteenth century. The series belonged in 1883 to the collection of a ‘M. de Malherbe’, from which they were sold in 1898 to a certain Jean-Baptiste Foucart." In 1899 this cycle of paintings was mentioned in a magazine for visual art (Zeithschrift für Bildende Kunst), but the paintings have since disappeared. By the time that Greer included a paragraph about Wautier in her history of women artists--and the obstacles they faced in their pursuit of their art--the situation had not much changed. Greer included a small black-and-white reproduction of Wautier's 1646 Portrait of a Man and referred to an engraving of her painting of Don Andrea Cantelmo, from 1643. She also mentions the inventory of Duke Leopold, but noted that it included only "two religious half figures." Even today, even on the eve of the Wautier exhibition, the exact number of her surviving works isn't clear. Estimates vary from 26 to 29 to 30. But things are looking up for this "long-lost" artist. Her Portrait of Martino Martini (1654) was recently sold at auction for £318,000. Baumgartner reports having seen Wautier's Portrait of a Young Man with a Pipe (1656) at a booth at the European Fine Art Fair, where the gallery owner Sander Bijl "is selling (or sold, and quite hush about either way) the 'Smoking Youth.'" The 2018 exhibition will not only display Wautier's work but will provide the occasion for a catalogue raisonné, prepared by Katlijne Van der Stighelen of the University of Leuven, who is also curating the Rubens House exhibition. In view of the coming exhibition, there is currently a worldwide search for six of Wautier's "lost" paintings: the five paintings depicting the five senses, and a floral scene, Garland with Butterfly, last displayed in 1960. According to the notice posted by CODART, the international group of curators of Dutch and Flemish Art, "In 1985, according to the catalogue of floral still lifes by Hairs, the painting was part of the collection of Parisian gallery owner Benito Pardo. After 1985, however, the panel disappeared from view." It will be intereting to follow the story of of the search for Wautier's works, in preparation for the 2018 exhibit.